Some folks in parts of this grand nation thinks Southerners talk funny. There’s a whole bunch of pointy-headed experts called linguists who spend time studying how people talk. They get deep into it, splittin’ hairs over the words we use, which they call dialect, and the way we say ‘em, which they call accent. Linguists are obsessed with stuff most Southerners never notice. They’ve got fancy terms like rhoticity for dropping ‘r’ sounds after vowels and happy tensing for how people finish words ending in vowels. They make a big deal over gliding vowel shifts, like the way people say the letter “i.” If you don’t believe it, try ordering some “nice white rice” while having lunch with a linguist in a fine dining restaurant in Manhattan. I don’t know how they figure out what words sounded like before audio recording was invented, but linguists claim that the ways Southerners pronounce and spell words have changed since the British brought English to America. This seemed far-fetched to me until I talked to my buddy, Nubs Lumpkin, who cuts boards for dresser drawers at the furniture plant. Nubs married a gal whose cousin teaches at one of the big universities down in Alabama. She can never remember which one, which only proves she ain’t from Alabama. Anyway, this cousin is a real, live linguist—writes books about language and flies off to meetings and such. Nubs’s wife’s cousin, if what he told her and she told Nubs and he told me is correct, has discovered that the origin of the modern name Alabama did not come from two Choctaw words like most people think. 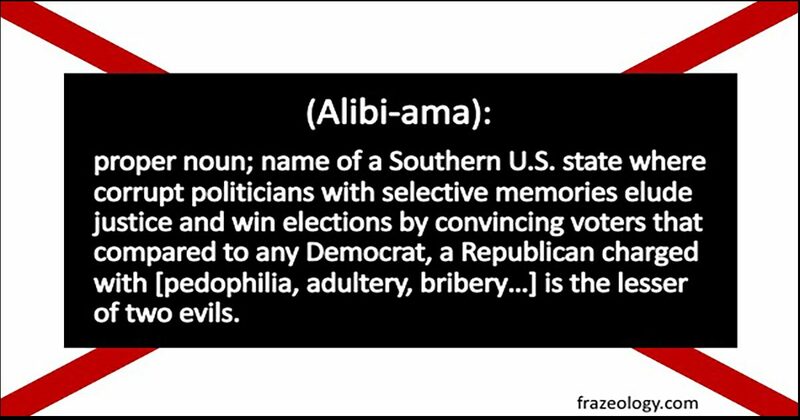 Nubs’s wife’s cousin says he’s found old court records that show the original name was Alibiama. He thinks it took hold there because so many defendants claimed they were in church or somewhere far from the scene of a crime, and somebody always backed up their stories. Nubs’s wife’s cousin isn’t sure how the spelling and pronunciation got changed but thinks Northerners who heard the locals sayin’ it thought they were just stretchin’ out their syllables and wrote it down wrong. I suppose Nubs’s wife’s cousin’s theory will be debated by the linguists and spark some haters to flood his Twitter feed, but it seems as good an explanation to me as any. I never wondered why people in Alabama spoke the way they do, but I’ve always been puzzled by how they vote.